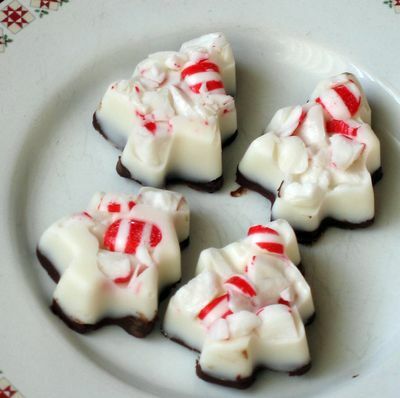 Peppermint bark is one of my favorite holiday treats to make. It requires very few ingredients and preparation, but delivers big on taste. 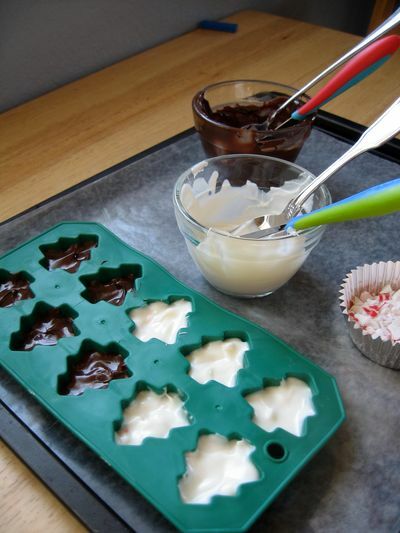 So, when I saw our local Dollar Store had ice cube molds in the shape of Christmas trees, I knew I could give this classic treat a little creative kick. 1. Unwrap the peppermint candies (as many as you think you will need) and place them in a plastic bag. Using the heavy end of a screwdriver or dinner knife, crush the candies into little bits. 2. Place several bits of the crushed candies in the bottom of each tree mold, enough to cover the bottom. 3. Heat the WHITE chocolate bark in a bowl for 30 second intervals, stirring as you go along. I melted about 1/3 of package a time. It’s easier to work with. 4. Once it is melted, use a small knife or spoon to cover the candies with the melted chocolate. Leave room for the layer of brown chips. 5. Place in fridge to allow to set for 15 minutes or more. 6. While White Chocolate is setting, melt the semi sweet chocolate in the same way as the white. 7. Remove tree mold from fridge. 8. Spoon melted BROWN chocolate over hardened white chocolate. 9. Place in fridge again to set. 10. 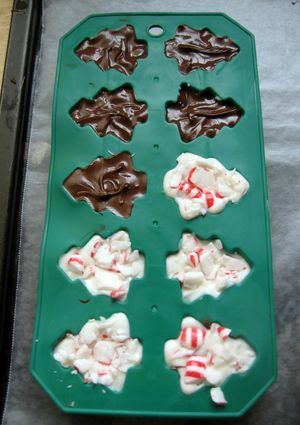 After 15-20 minutes, remove from fridge and gently peel the silicone mold away from the candy. Ingredients purchased should make enough for 20-25 pieces. 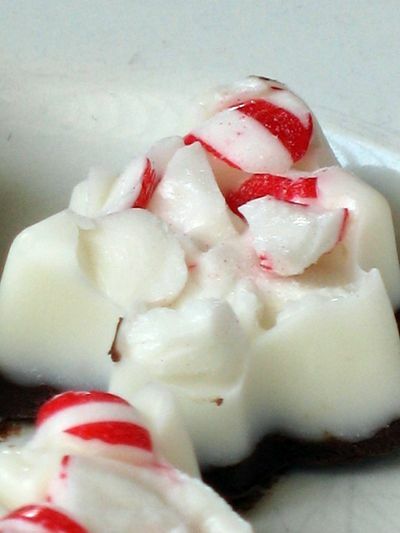 **I definitely recommend layering the candy in the order mentioned above: Crushed Peppermint, White Bark, Semi Sweet Chips. Other variations, like trying the semi sweet chips first, did not produce the same result. **Let the final layer set extra long if you can. It will make peeling the treat from the silicone that much easier. **You can use only the white or semi sweet chocolate if you choose. I think adding both adds a bit of interest. These are pretty, and I saw those molds at out Dollar Store. I think I’ll stop by and grab some. Thanks for sharing. OMG! this is a great idea! I’m so doing it this year. What a great idea! This would be perfect for office gifts and even stocking stuffers. Off to Dollar Tree! Oooh I haven’t seen these molds! I will have to look! Yummy – I need to check out the dollar store to see what there is. This is awesome! I’m definitely going to have to try this out as Christmas gifts! Just made some of these tonight, and they turned out very pretty. Thanks again. oh this is just the kind of thing i’ve been looking for! we will be making these this weekend. thank you!!! 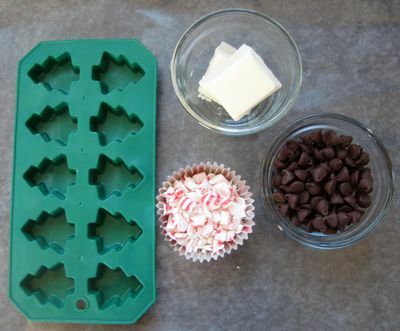 I saw this post and had to try this for our Christmas goodies this year. Our Dollar Tree had these, so I grabbed one. They also have snowmen, but I definitely think the trees are cuter. As a broke college student, I’ve been looking for creative, inexpensive goodies to make for my friends. This is perfect! Thank you! What a great idea. And such a good idea for neighbor gifts. Love it! TOTALLY making this for gifts this year! Thanks for the great idea. I can’t wait to taste one, myself! It’s 2010 and I saw these same molds at the Dollar Tree this year! woo-hoo! Thinking about investin in another set to make these again. They turned out so great. Super cute Idea!!! Did you have to spray the trees with Pam or anything first? They popped right out?